Roadside geology Not all of the field trip stops required a hike. Brian Knieser 09 conducts a discussion of mafic rocks of the Piedmont at an outcropping just off a highway. A lookout yelled car coming to keep things safe. In the basement Graham Lederer 09 (yellow hat) shows fellow students around some of the geologic features of the basement below Beaver Creek Dam. This shear zone is geologically contentious. First stop Geology Professor Chuck Bailey gives an overview of the geology near Rockfish Gap. Drew Laskowski 10 and Graham Lederer 09 hold the map for reference. Testing...testing Drew Laskowski, Ali Snell and Claire Still, all members of the class of 2010, test the pH of a soil sample. Led by soil specialist Jim Kaste, the students compared the soil at various points to study erosion and weathering. Pre-hike orientation Ali Snell 10 (left) gives a briefing before a hike up Turk Mountain to discuss Blue Ridge strain analysis from deformed sandstones as Jenny Whitten 09 waits to speak. Associate Professor Greg Hancock keeps his end of the map up. Near Rockfish Gap, Virginia's Shenandoah Valley, Blue Ridge Mountains and Piedmont all come together, creating what amounts to a geological smorgasbord in a relatively small area. It's the perfect venue for the geology department's annual Senior Research Adventures field trip. Supported by the Mellon Foundation, these trips are a chance for the department's more advanced students to discuss their research projects in situ and for the younger geology majors to learn techniques, inspect a variety of formations - and learn that there is no such thing as Afton Mountain. On a crisp weekend in late March, three vans of geologists made the trek. It was essentially a whirlwind tour, with stops from the top of the Blue Ridge to the bottom of a Piedmont slate quarry to examine everything geological, from mountains to a handful of soil. The vans made a handy surface for the map-assisted overview in a series of parking lots that began each presentation. The geologists climbed two peaks during the weekend, including a scramble out to the high tor of Turk Mountain where Jenny Whitten '09 talked about her work on erosion rates in the Blue Ridge and Ali Snell '10 spoke on strain analysis from deformed sandstones. After the descent, the trip's official soil geologist, Assistant Professor Jim Kaste, began the first of a few soil-coring parties. Graham Lederer '09 led a trip down to the "basement" rock below Beaver Creek Dam. Professor Chuck Bailey said the shear zone below the dam is a contentious one: "This is the kind of a place that makes geologists get hot under the collar, but I think Graham's studies have nailed it down pretty well." 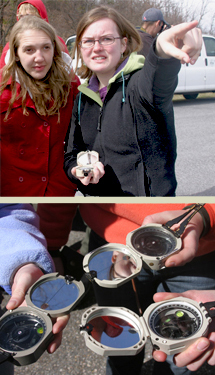 Faculty and older students taught newbies the basics of using a Brunton Pocket Transit, a compass equipped with a bulls-eye level, allowing you to measure the dip of a geologic feature as well as the direction it's running. There were plenty of opportunities to examine fossil tubes of skolithos worms. Geologists use the deformity of the normally round worm holes to assess rock deformation from pressure and other forces. Just off the Skyline Drive, Drew Laskowski '10 spoke about Blue Ridge structural analysis/ancient rift basin at the Moormans River Overlook. On the Piedmont, the group visited the Solite slate quarry, where Sarah King '09 spoke about the geochemistry of the Arvonia Formation and Bailey led the group in the "hand game" - a rough-and-ready method to determine how forces have shaped rock. 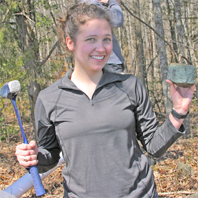 The Senior Research Adventures is just one of many field opportunities conducted by the geology department. There is a departmental field trip each semester to one of the many geologically significant areas of the Commonwealth. One trip might feature a hard-hat excursion into the depths of a western Virginia cave; another might include a discussion of the geological significance of the ballast stones inside the Jamestown palisade. Individual classes are heavy on field experiences, as well, showing students in the field what they've discussed in the classroom.